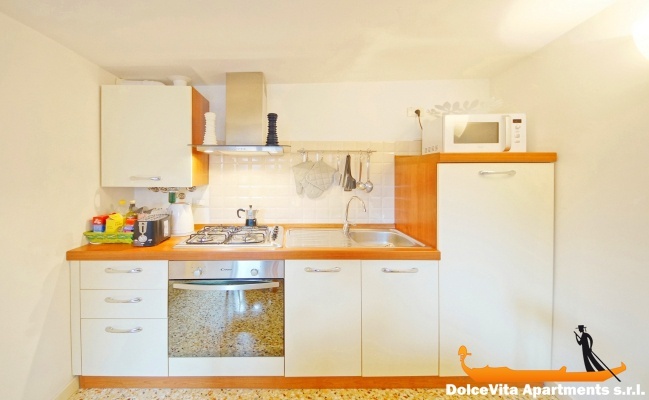 Apartment N. 127: It can accommodate up to 5 people, it is rented from 75 € per Night (not per person). Lovely apartment on the third floor of an historic building close to Campo S. Aponial, 1 minute walk from the Rialto Bridge. 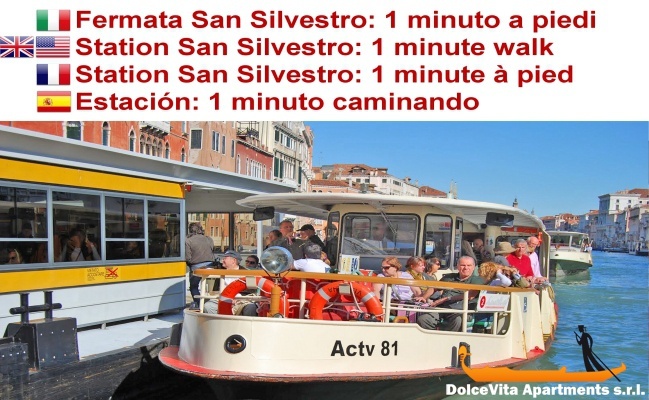 The waterbus stops of “San Silvestro” or “Rialto Mercato”, allow you to get into the apartment without having to cross any bridge, in 1 minute. The apartment has been completely renovated at the beginning of 2013. 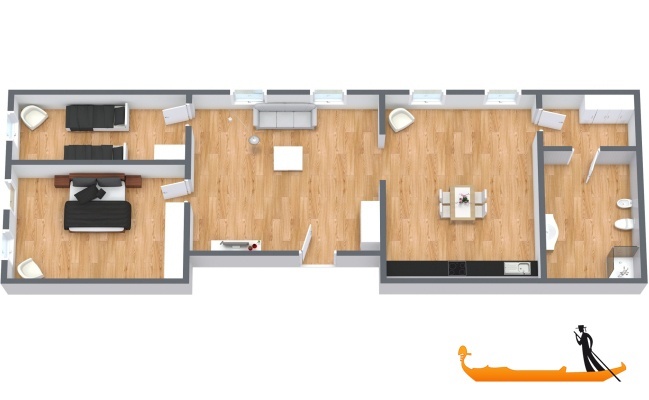 It consists of two double bedrooms, one of which may be single, a beautiful living room with sofa and plasma TV. The kitchen is bright and comfortable and it is well equipped. Finally there is a bathroom with shower. The apartment is equipped with wi-fi, and it has a wonderful view over the roofs and the bell tower of San Aponal’s church. A few steps from the apartment you will find all services, including ATM. 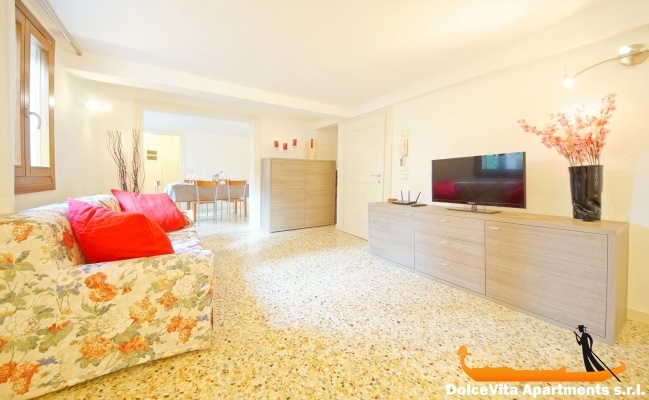 Clean apartment, in a quiet street, very convenient, close to the Rialto Bridge and the Rialto Market, very lively area with lots of fashion shops, restaurants, jewelry, bakery and a Coop. Pleasant stay despite the bad weather. We will return, to recommend with a rating of 5/5. 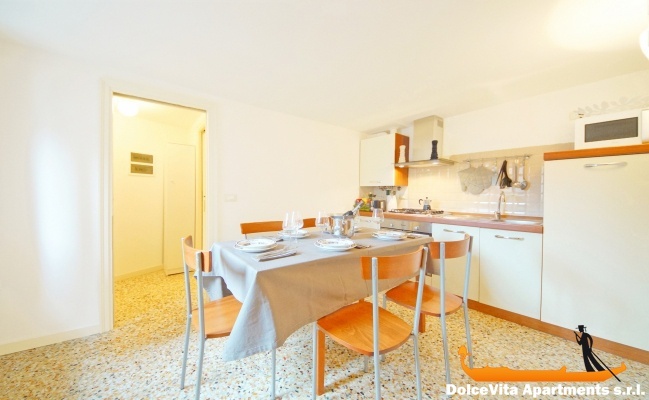 Alvise, very nice, with clear explanations, and net, we had no problem for the payment of rent. Thank you. 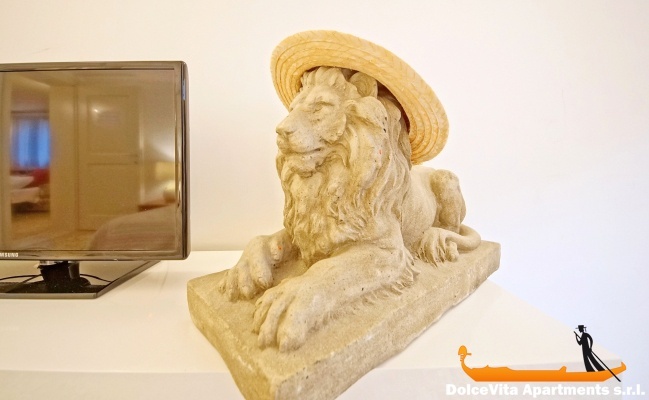 It's very well located, close to the Grand Canal and Rialto Bridge. The photos correspond to reality. 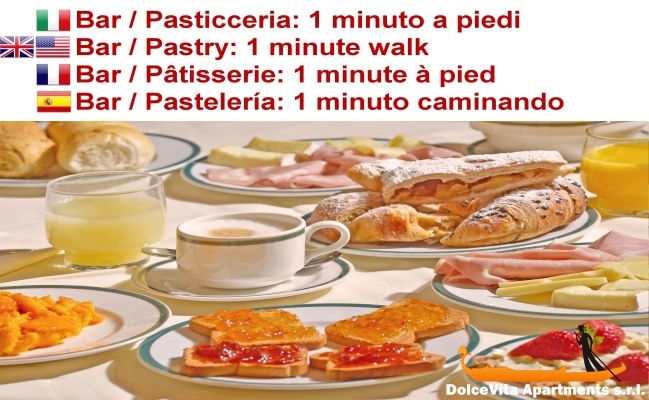 As for the service, everything has been explained very well, good organization, in short happy to have used VeniceApartmentsItaly.com, thank you. Very clean and pleasant, ideally located and yet very quiet. The rooms are large enough and the bedding is comfortable.The son of the owner who welcomed us was very helpful and he took time to explain and to answer all our questions. easy and safe rental. Attention to the description of the apartments: all words count. Do not hesitate to book several months in advance. We will reuse. Apartment well located, spacious and comfortable. 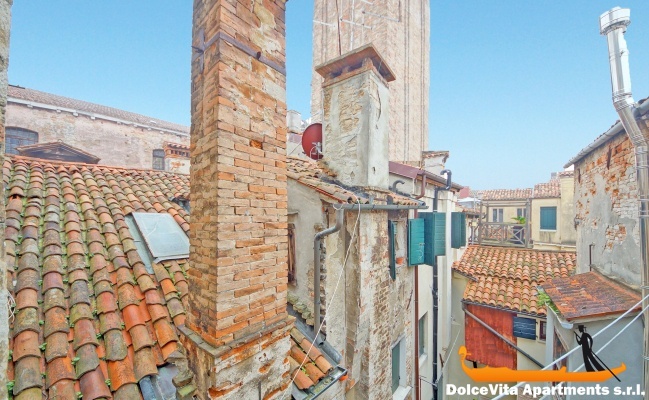 Fantastic apartment to visit the center of Venice. I rate this apartment as a 5. The location is excellent, near the Rialto, but on a very quiet street off the main drag. The apartment was very clean, and the kitchen and dining gear was well-stocked. It was nice to buy fresh seafood at the nearby Rialto fish market, then come home and prepare it for our meal! People should be aware that there are 50 steps up the stairs to the apartment, but my wife and I are in our mid-70s and had no trouble climbing them. The bed was comfortable in the master bedroom (the only one we used). The arrangements for reserving, paying, and moving in went smoothly. It would be nice to have information in the apartment about surrounding shops, restaurants, etc. Stefano gave us some information about this. 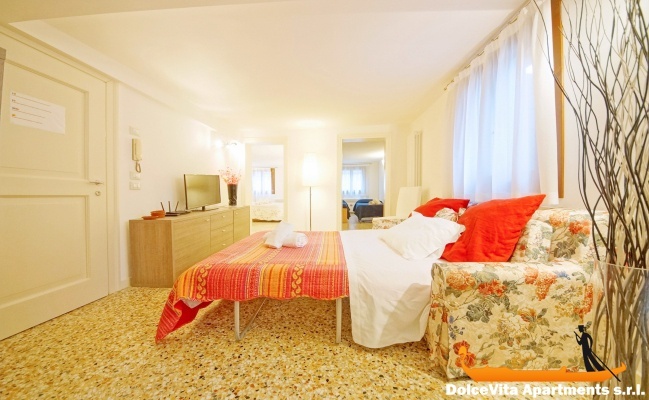 In summary, I hope this apartment is available on our next visit to Venice,so we can again stay there. the apartment conforms to the description of your site, clean, very well located. near the Rialto Bridge and Piazza San Marco. Clean, functional, perfectly suited to the description given. 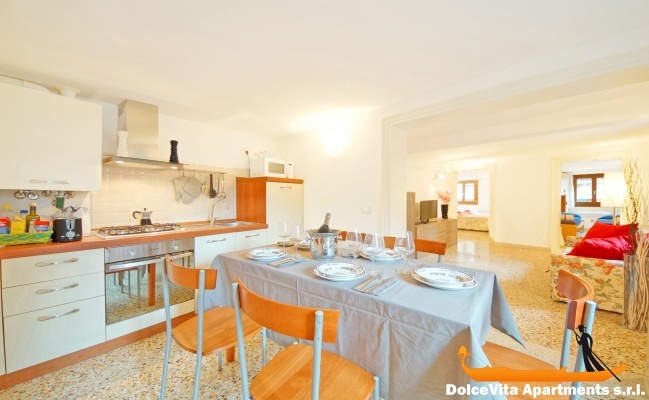 Very well located apartment, 5 minutes from the Rialto bridge and the market. 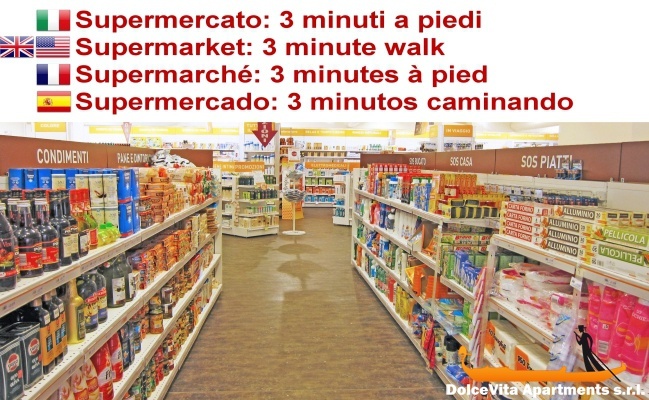 A supermarket just beside allows you to buy necessary. Very good pizza in a street restaurant, about a hundred meters. The apartment is very clear, clean and functional. The beds are comfortable. Very efficient service with excellent communication and very fast answers. We rate the apartment at 5. We thought the apartment was excellent, great location, comfortable, well furnished, Wifi worked perfectly,everything we needed. The service was very good, Signor Filippe met us as arranged, was very helpful and showed us how everything worked. 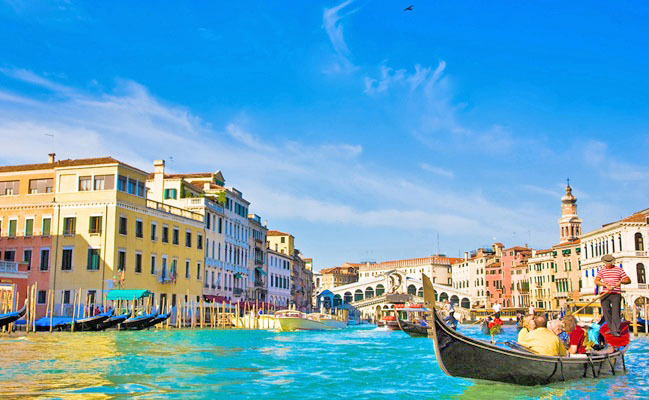 We would definitely book it again next time we come to Venice. The apartment 127 is conform to the description of the site without unpleasant surprises. It is very clean, comfortable, well-heated, well equipped, comfortable bed, ideal for two adults and two children (8 and 10), quiet area, close to all services. Very nice welcome in French, by Mr Filippi. I stayed in this lovely apartment with 2 friends. We met Stefano (our apartment contact) at the San Silvestro vaporetto stop, as planned. He took us to the apartment and along the way pointed out where the grocery store was located. We loved the location of the apartment. Stefano carried our luggage up the 2 flights of stairs. I thought the poor guy was going to have a heart-attack but he insisted! The apartment was very clean and we loved that there were a lot of windows and air conditioning. There were plenty of towels, great water pressure, well stocked kitchen and comfortable beds. I would recommend this apartment to my family and friends. We are really pleased with our stay in Venice. The apartment N 127 is very well, comfortable, very clean, functional, well equipped and especially very quiet. 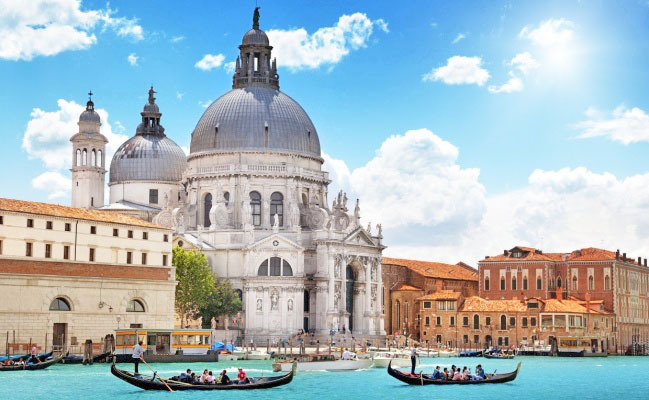 It is very well located, close to shops, the Grand Canal, and the main interest places. This is a place we'll recommend. We rate it 5, without hesitation. The service provided by Mr Filipi is perfect, right at the rendezvous, with good advices about main places. We have nothing to complain about and we are pleased to have made this choice, at first your rental agency and then the apartment itself ,according to what we wanted. We are very happy with our stay at 127. I'm tempted to put a 5. There is only a problem! We did not have wi-fi. We called and the problem was resolved immediately. In addition it was very clean. I recommend this apartment to everyone! Great location, clean and well structured! Apartment very comfortable, very quiet, very well located geographically. 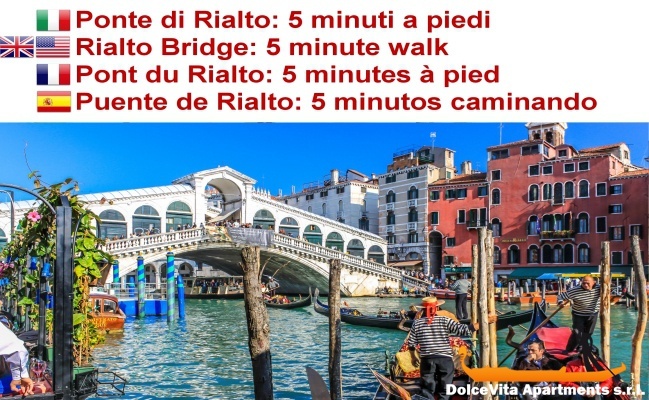 We were close to all the little useful shops: Coop, baker, cheese, ice cream and especially the Rialto market for fruits and vegetables and its excellent fish! We also took advantage of the small restaurants very close to the apartment, very good quality / price ratio! This is a rental that we can recommend being sure that it will please! Renovated apartment, clean and quiet. 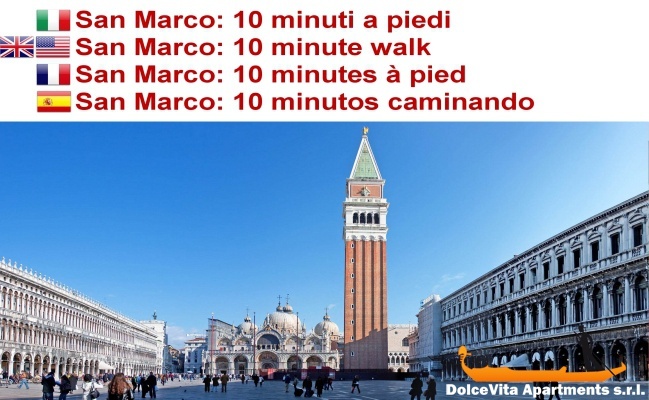 Good location in Venice, close to shops and vaporetto. 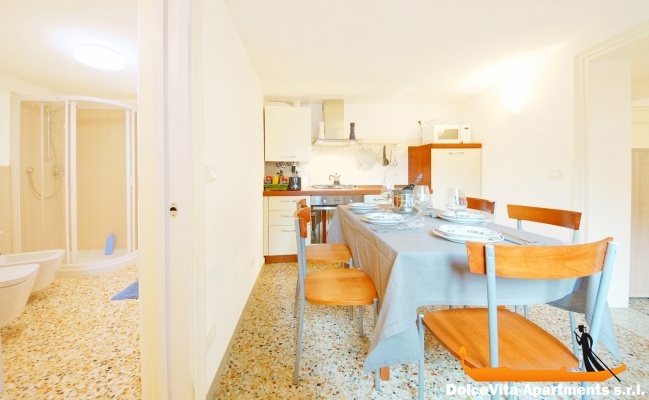 Great location in an interesting part of the city, very convenient for vaporetto, nice local restaurants, very useful having little Coop supermarket so close, in July the air-conditioning was WONDERFUL!. Really spacious for 3 of us and very well equipped. Great service from you - a pleasure to deal with and very efficient. Five stars!! 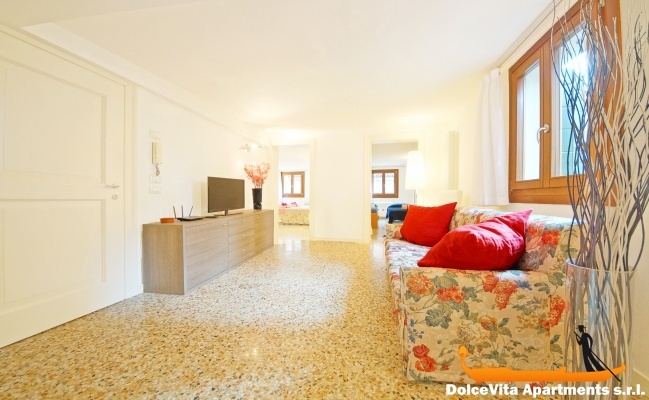 Stayed here in June 2014 and loved this apartment near the Rialto and campo San Polo. It was really close to everything we needed, just remodeled, and very clean. Sleeps four comfortably with two more on the pull-out sofa, so ideally 6 can sleep here. The 3 air-conditioners worked great. A Coop grocery store is steps away as well as a vaporetto stop, which is important when hauling luggage to/from the train station (otherwise we just walked everywhere). It's also near one of the main 'streets' but a church (San Aponal) muffles any noise so the place is super quiet. Just behind the apartment is a charming neighborhood devoid of tourists and a cute little family-run restaurant, Al Ponte Storto, which was pretty good. Also just steps away is a wonderful 'take-away' restaurant, Acqua & Mais, run by Venetians that has delicious Venetian food you can take back a reheat. Stefano greeted us at the vaporetto stop and was very welcoming and informative -- great guy! I would rate the apartment a 5. It was very clean and neat. We were quite comfortable. Stefano met us on time at the vaporetto stop and was very helpful. He showed us how everything worked and explained the keys which were a little tricky. 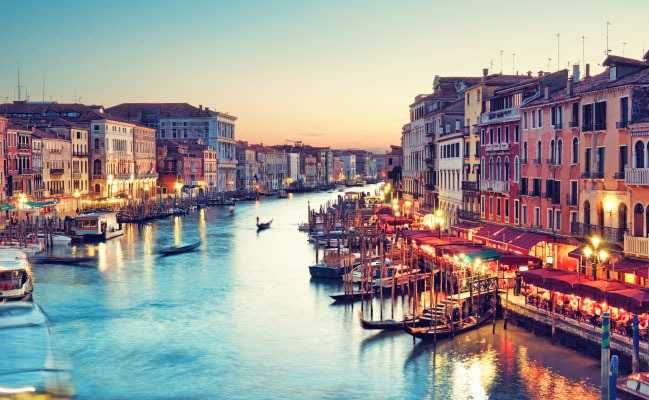 The apartment is convenient to the Grand Canal and the Rialto Bridge yet out of the way on a quiet square with a coffee shop and restaurant which were quite good. We had a very pleasant stay in Venice. The apartment is very well located for our visit to the Biennale, recently restructured, so everything is new and fresh. The beds are very good and we were very happy with the wifi. Apartment very clean, coming up to our expectations. Great welcome from Mr. Filippi, very clean apartment well equipped. 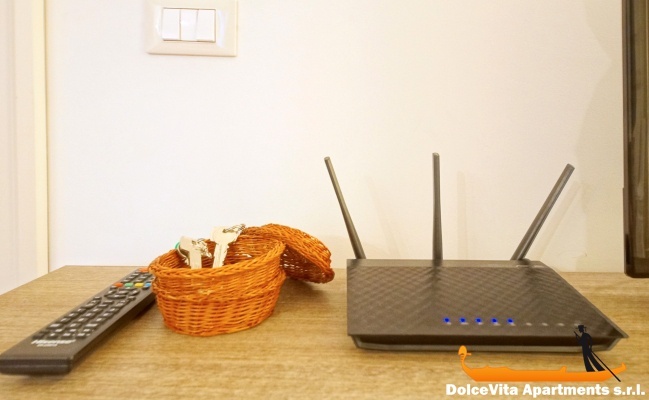 We could not operate the television in French nor to connect with the internet, but we did not come to Venice for this.